Where is the PS4’s Titanfall? I recently got my eager hands on a demo of Infamous: Second Son at a retail preview event and I left with a distinct feeling that it won’t be the killer exclusive that the PS4 has been waiting for. With Titanfall due to hit rival platform Xbox One later this week, I was left wondering when the PS4 can expect to see its own exclusive that builds up a similar degree of hype and enthusiasm. Rest assured, this isn’t a PS4-bashing article. Hell, I’m still glad I opted for the Sony platform last November, largely in part to many the multiplatform titles -current and upcoming- performing significantly better on the PS4. Sales of the console have been strong too and PS Plus remains an attractive proposition even if we’ve noticed it treading water a little on the PS4. But where are the games to look forward to that make the PS4 the obvious choice for gamers yet to splash the cash on a new console? The Xbox One has been losing out so far in no small part because of the high price compared to the PS4, but we’re now seeing regional price-cuts making the Microsoft console much more competitive. Take the UK market: the solus console used to be £425, but now you can order a Titanfall bundle for £399, that’s just £10 more than the PS4 Infamous: Second Son bundle. Going forward, the price difference just isn’t going to be a selling point anymore. 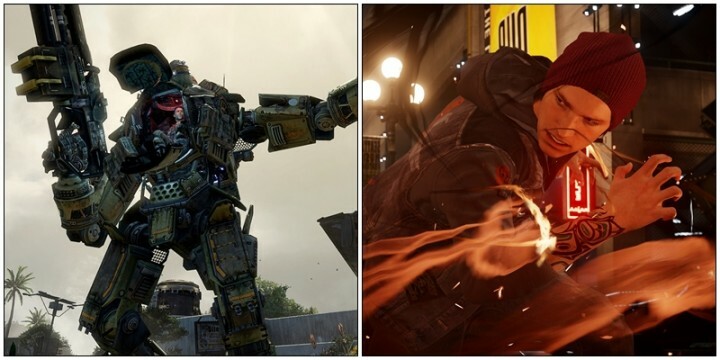 When looking at the release schedule this month, it’s become clear to me that Infamous is really up against it in the battle for gamers’ time and money against Titanfall. Sony haven’t helped themselves in this matter either, offering few updates about the game itself and keeping hands-on opportunities unavailable until very late in the day. The demo I played didn’t impress on a visual scale beyond a few neat particle effects when absorbing neon or smoke powers. Admittedly, it only included a small part of the game’s map, but man, it was so grey and dull with no extra texture detail to be found on walls or on the tarmac. I was assured this was quite an old demo and the final game looks better. But then why the hell is Sony sending this decidedly crappy-looking demo around the country in an effort to drum up pre-orders? Combat felt decidedly last-gen too, with clunky melee moves making Delsin’s fiery chain attacks feel like like Kratos on tranquilisers. Switching to Neon mode (not just electricity with a dash on pink, honest) proved to be a real letdown as Delsin only had pithy ranged attack with no melee options. Fingers crossed more moves will become available in the final version. More frustrating is Sony’s silence on what other powers Delsin will be able to steal from other Conduits. If we get the final game and all we’ve been waiting for is an ice blast we’re not going to be happy as the PS4 exclusive already looks like it’s barely moved on from the PS3 games. I really hope I’m wrong when the finished version of the game turns up and it blows us all away, but is anyone else getting that feeling we’re looking at an enjoyable 7/10 rather than the game to tell our Xboning friends that we’re not feeling that bad about not playing Titanfall? My current thinking is that Titanfall will eventually make its way to the PS4 in the shape of Titanfall 2 as Microsoft have failed to lock-down sequel rights so far and EA aren’t stupid enough to avoid doubling their audience unless MS throw an obscene amount of money at them –also possible. For now, I’ll just keep telling myself that I’m not that bothered about missing out because Titanfall is online only. Except, I played Titanfall at an expo last year and knew there and then this was going to be huge. Are the killer app exclusive games coming from Sony and third party developers? Of course they are. But Sony is playing a dangerous game by not showing us anything to compete with hype being generated by Titanfall. The new Uncharted will be ace, I think that’s a given, but where’s the footage? The Order: 1886 looks interesting, but we’re going to need a bit more convincing it’s not just another third-person shooter and hopefully someone will convince Ready at Dawn to get rid of the awful ‘cinematic’ widescreen borders. All the while Titanfall will be in every shop window for the next few months and before you know it, the hype machine will start rolling through with Halo 5 on its back. Can Kratos and Nathan Drake take on the mechs and Master Chief? You’re damn right they can, but Sony needs to get them off the bench and into the game before it’s too late. Many pundits suggest that Sony is waiting until E3 to show us some footage from Uncharted and probably unveil a few new exclusives. Usually, that would be fine and definitely something to look forward to as expo season heats up our summer, but Sony need to show gamers something NOW. Many gamers yet to make the leap onto next-gen consoles will be hungrily looking at the Titanfall bundle this week and Sony need to make the PS4 an attractive alternative with the promise of some huge games to look forwards too. So far, they’re relying on faith that little bit too much. Sony could reclaim the console-crown from Microsoft this generation and they’ve made a good start, but it’s about time they got stuck into the war for real rather than sitting back and gleefully watching other devs win the smaller battles for them with better resolutions and frame-rates for third-party titles. We’d love to hear what you lot think about Sony’s slight stall since launch. Are you still trying to decide which console to buy? Is Titanfall deserving of the hype? Sticking with your last-gen machine for a while? Or are you mocking us all from your PC gaming pedestal where you can play Titanfall at 1080p?